When it's cold outside, few things are more soothing than a hot bath, a warm blanket or trying out a few hot toddy recipes. Whether you are feeling festive or maybe even a little under the weather, it's easy to concoct this age-old wintertime drink. You may wonder what exactly qualifies a drink as being a hot toddy, and you may be surprised to learn that this term actually encompasses a wide range of drinks.The origin of the name "hot toddy" is unknown. Some people suggest that it comes from India's toddy drink, which is made from a fermented sap found in palm trees. However, traditional Scottish hot toddy recipes, which are similar to what people drink today, involve no such ingredient. 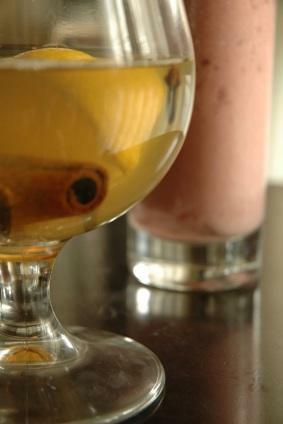 What all hot toddy recipes have in common is that they are served hot, as the name denotes, and they contain alcohol. Most often, recipes ask for rum, brandy, whiskey or even gin, and you can substitute to fit your taste. Experiment with the following recipes and choose your favorite. To make these hot toddies, combine the ingredients in a mug and allow them to sit and "brew" for a few minutes before serving. Although a hot toddy may feel soothing to a sore throat or seem to open your nasal passages, keep in mind that alcohol can be dehydrating and therefore not the best 'treatment' for your cold. Although a hot toddy may at least help you fall asleep, avoid combining it with cold medications. Be careful to let the hot toddy mixture cool before serving so you don't burn your tongue and throat. Use a heatproof glass such as a ceramic coffee mug in which to serve your hot toddy. While some restaurants and ski lodges feature hot toddies as part of seasonal drink menus, don't count on being able to order one when you are out. However, remember you can always make one at home! Making a hot toddy may seem a litte complicated, but in reality it's not much more effort than making a cup of tea. If you have a cold or the flu, this drink may help take the edge off and help you sleep or at least relax. Otherwise, it makes a cozy companion for a winter afternoon by the fire.